An exacting turntable for DJs, producers & record fans, with unprecedented features & graphics. Welcome to Helix, a software turntable with a better design from the ground up. Follow @HelixApp for updates and interesting tidbits. DJs: Check out the beat-mix demo below. It demonstrates the super-accurate pitch control unique to this turntable. If are not into DJing, but you still love music: The graphics of this app are designed to convey the realism of playing a real record; and you can customize the colors. If you play your own instrument: This app lets you easily and precisely adjust the pitch of songs so you can play in tune with your music. The idea behind this project is that a software turntable should be first and foremost a simple musical instrument. 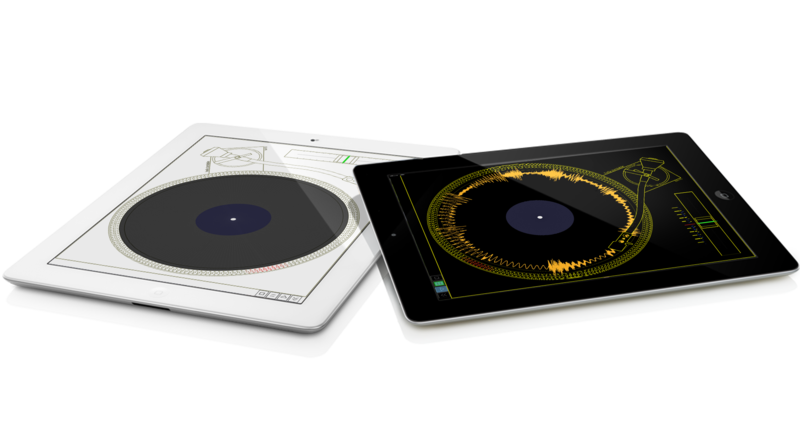 The aim of Helix for the iPad is to provide a clear and simple, high quality turntable that lets you focus on the music coming out. Unlike other apps that were only designed for one screen resolution, this one is actually a graphics engine, somewhat like a video game, that adapts to any display size, making it perfect for retina displays. A radial waveform is displayed right on the groove. This makes it intuitive to see the progress of a song. You can darken the display for playing indoors, lighten the display for DJing in the sun, or just choose the colors you like. The iPad is not the same as a physical record player. But Helix will be performance-tailored to squeeze the best out of the iPad and to promote fail-safe playback with well designed controls and predictable response. As one example, Helix introduces tape-style transport controls, with scrub and pause functions that don't let you loose track position. In fact, wav files support tags much like mp3s, but unfortunately many music players do not offer any support. Helix will. The originating idea for a precision turntable was the common problem of having badly pressed records that need complex oscillating pitch correction. Because such functions are not DJ performance oriented, look for these capabilities in the PC & MAC releases. The playback geometry algorithm in this program is based on real-world measurement units. That means you can specify the offset position of the record from the spindle by a fraction of a millimeter, and it will sound just like a record played in real life that same way. Turntables are elegant mechanical and electronic marvels. In true form for a digital recreation of the turntable, in the desktop versions you can adjust the tonearm geometry and even see the resulting tracking errors. Also in the desktop versions, an expanded producer & audio engineer tool set will let you save audio files and more. 1. Fulfilling the Kickstarter Rewards as scheduled, including the graphic designs and artwork outside of the software itself. 2. Porting to iPad framework from the prototype software. This involves translating various functions to the native interfaces of devices and operating systems. 3. Introduction of additional features currently in testing, and addressing of beta-group suggestions and feedback. 4. Careful testing to ensure Helix will perform well under all possible circumstances. 5. Audio quality optimization, graphics streamlining and performance tailoring for iPad. *Some graphics may be adjusted to ensure the musical performance is not affected by graphics demands. 6. Finalizing desktop versions, finishing expanded feature sets and compiling to PC and MAC operating systems. Costs: The remaining work represents a major time commitment over the following year. Equipment costs include the purchase of machines required to develop and test the software (current development machine is a bare-bones PC). Further expenses include Apple developer subscription and other service and filing expenses related to registering and establishing the software release. My dream is to create advanced instruments that people will love. I love musical instruments. With your help I would like to make something truly original and great that comes equally from my heart and my mind. Years in the making, this is a software turntable that's different from the rest. This is an original, innovative and passionate effort with major attention to detail. It is nearly finished, but porting it to the iPad and desktop will be a huge job, and I need all of your possible support. I have used real turntables for a long time, and I designed this software to have a very good feel for beat-mixing. Musicality is my goal. More features are just around the corner, so please stay tuned for updates. I really appreciate your support of this project, and I hope with a successful drive this software will soon inspire your musical excitement and creativity. Thank You For Your Support. Stay creative! One beautiful Helix DJ custom vinyl sticker! Early Bird DJ Special, limited number! One Helix DJ custom vinyl sticker. DJ: One software copy for iPad, and: Exclusive insider memos about features and looks behind the scenes, plus: Receive a set of wallpaper graphics. One copy each of iPad version and PC & Mac Pro versions with advanced geometry features. Exclusive insider memos about features and looks behind the scenes; set of wallpaper graphics; one Helix DJ custom vinyl sticker. A limited-edition screen printed t-shirt sporting a cool Helix-inspired graphic. Beta-group membership in which you may test, suggest and help improve features. Your name and/or company acknowledged in the software credits and on the homepage for your gracious support. Two custom-decorated specially prepared iPad3s with high quality audio cables ready to plug into your favorite mixer! One software copy for iPad, mac and pc each; custom-logo iPad sleeve, and your name and/or company acknowledged in the software credits and on the homepage, plus: a unique piece of hand made art by Peter Adany to thank you for your generous contribution.